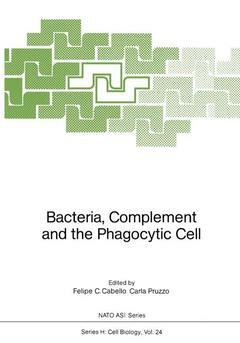 Phagocytic cells and complement are probably the most important components of host defense against bacteria which, after overcoming the mucosal and epithelial barriers, multiply in the subepithelial tissue and may threaten to disseminate and invade the blood stream and different organs. Questions concerning the factors which regulate the interactions of the bacterial cell with host defenses are a challenge to research and lead to practical applications for the prevention, treatment and diagnosis of infectious diseases. The questions of expression and regulation of virulence related bacterial genes and gene products, the specific mechanisms of defence reactions by complement and phagocytic cells, their mutual interactions with bacteria and especially bacterial surfaces are focused. Considerations on how to translate this knowledge into the management of infectious diseases are also included. The murein sacculus, the bacterial exoskeleton-structure and function in the bacterium and possible role in the host organism.- Chemical nature and cellular location of adhesins of E. coli.- Genetics of O antigen polysaccharide biosynthesis in Shigella and vaccine development.- Capsular polysaccharides (K antigens) of Escherichia coli.- Biogenesis of Gal? (1–4)GA1 binding p-pili of uropathogenic E. coli.- The evolution of M proteins of Group A Streptococci.- A new family of pore forming proteins, the perforin family, in immune cytolysis by complement and by lymphocytes.- The molecular basis of the interaction of immunoglobulin G with complement and phagocytic cells.- C3 binding to bacterial surfaces.- The mode of C5B-9 attack on susceptible gram negative bacteria.- Salmonella and complement: the critical influence of 0-polysaccharide within LPS.- Ability to activate the alternative complement pathway as a virulence determinant in Salmonellae.- Interaction of Haemophilus influenzae with complement.- Interaction of Pseudomonas aeruginosa with complement.- Complement-mediated opsonization of group A Streptococci inhibited by the binding of fibrinogen to surface M protein fibrillae.- A surface protein of KLebsiella pneumoniae and Escherichia coli that binds phagocytes and inhibits phagocytosis.- Adhesins, serum resistance and cytolysins of E. coli-genetic structure and role in pathogenicity.- Phagocytosis and intracellular biology of Legionella pneumophila.- Induction of inflammation by Escherichia coli at a mucosal site: requirement for adherence and endotoxin.- IgA-armed T lymphocytes as anti-S. typhi effectors in humans.- Interference of a Staphylococcus aureus bacteriolytic enzyme with polymorphonuclear leucocyte functions.- The opsonic capacity of monoclonal antibodies against Escherichia coli 0111 and its rough mutant E. coli J5.- A mutation in Salmonella typhimurium that enhances resistance to oxygen-independent antimicrobial neutrophil protein.- Plasmid-mediated complement and phagocytosis resistance in E. coli.- The relative role of lipopolysaccharide and capsule in the virulence of E. coli.- Lectinophagocytosis of bacteria mediated by carbohydrate-lectin interactions.- Responses of phagocytosis to bacteria.- Non-secretion of ABO blood group antigens and susceptibility to infectious diseases.